Earlier this week the finalists in the 2018 IBM iX everywoman in Travel Awards finalists were announced online. From young apprentices starting their career journey, to well-established entrepreneurs inspiring other ambitious individuals to join the industry, the 29 finalists are the role models whose success stories will encourage the next generation of travel stars. This year’s finalists were hand-selected by the industry’s most discerning leaders including Chris Browne OBE, COO at easyJet; Jackie Wybrow, Senior Director, People Operations, TripAdvisor; and Jo Rzymowska, Vice President & Managing Director at Celebrity Cruises. 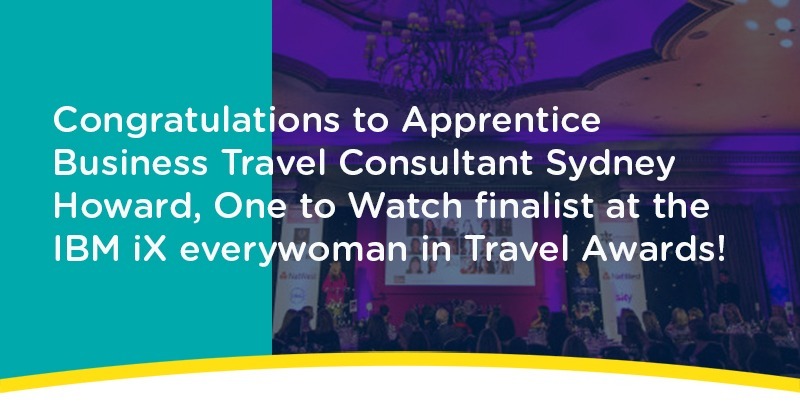 We are pleased to announce that our Apprentice Business Travel Consultant, Sydney Howard, has been selected as a finalist in the One to Watch category, sponsored by TripAdvisor. This Award is for a young game-changer under the age of 21 in education or apprenticeship who demonstrates a passion for the travel industry. Sydney is in her second year apprenticeship assisting clients on every facet of their journey, from booking air, rail and hotel through to offering destination advice. In her relatively short time at Clarity she has received numerous internal and external accolades, demonstrating her passion for the travel industry and her ability to go far. She was nominated for two consecutive years at the Clarity Brighter Awards and was awarded Damar Student of the Month in May out of over 1700 apprentices. Sydney has also received the Above and Beyond award 3 times, making her one of the highest performing consultants in terms of customer service within the business. Winners will be announced at a ceremony held at East Wintergarden, located between the iconic towers of Canary Wharf in London on 14 November. Click here to read more about the 2018 IBM iX everywoman in Travel Awards.